The year 1979 marks a very important landmark in the history of postal service in India. The year marks the 125th anniversary of the first Indian postage stamp, 100 years of postcard services and 50 years of scheduled carriage of domestic Air Mail! As a fitting culmination to the celebrations connected with these events, the Indian Post & Telegraph Department, in collaboration with the Philatelic Congress of India, hosted 'INDIA-80', an International Stamp Exhibition at New Delhi, from 25th January 1980 to 3rd February 1980. This was the first International Stamp Exhibition to be held in Asia under the patronage of the Federation Internationale de Phelatelie. To commemorate these events, special postage stamps were issued on 25 Jan 1980 on the Inaugural Day of Exhibition. This 3rd issue of postage stamps honours the “proto-stamps” of India on its 100 paise commemorative stamp! Copper Tickets: Copper tickets, claimed by many to be the first postage stamps of the world, were small copper tokens of fixed values that were bought to send letters across the country. It was first issued in Patna on March 31, 1774, and was valued at 2 annas (12.5 paise). To ensure that postal services were available to a certain extent in private communications also, a system of dak carriers was formed. They delivered post between various places of importance. The system connected the headquarters of the government with the towns and principalities in various provinces. Routes were fixed and various weekly and monthly services were started and charged at 2 Annas for every 160 kilometres. 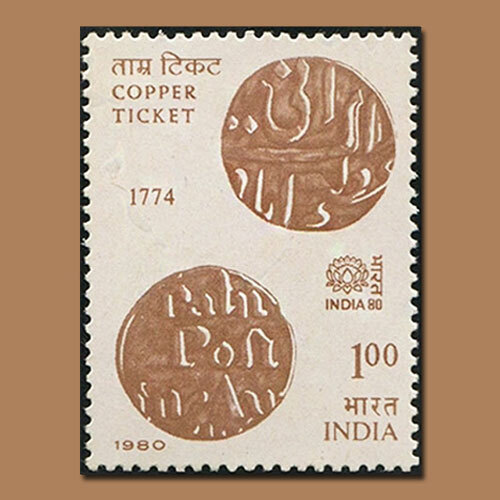 These ‘copper tickets’ were prepaid and hence claim the status of the world’s first ever postage stamps. Interesting isn’t it? So, what do you think? Are these Copper Tickets the world’s first ever postage stamps?